This article describes how to parse the content of a SVG path element and create a set of JavaFX PathElements which are added to a javafx.scene.shape.Path. The idea behind this is that the JavaFX Path can be used to create a PathTransition. I used the Apache Batik parser to split the SVG path element and wrote my own PathHandler to create the PathElements. This means: Parse a SVG string M 150 50 L 550,50 A 50 50 0 0 1 600,100 L 600,350 and create PathElements (ArcTo, LineTo, MoveTo, CubicCurveTo). I will demonstrate how to parse the SVG path with a little JavaFX demo application. The Alien Rallye :-) (A small alien is moving along a Path animated by a PathTransition. Every time I changed the layout of the track it takes me some time to adapt the coordinates. So I though it would be nice if there is another way to change the track. For example use a Vector drawing program to change the track and export a SVG file (Inkscape, Adobe Illustrator, SVG-Edit, ...). I knew that JavaFX supports SVG and I experimented with the SVGPath class. The problem was that I didn't find a way to create a Path from SVG path element. I found the class ShapeConverter (Part of the JFxtras project) in a Blog-Post from Gerrit Grunwald. This class provides some methods to convert PathElements into SVG strings or SVGPaths. The problem is that I didn't find a method for the other way around, i.e. create PathElements from a SVG strings. Keep in mind that this is a very short SVG path. The SVG path of the following screenshot from the Alien Rallye application has 25757 bytes. I was not keen on writing my own parser so I tried the Apache Batik framework. I found the PathParser which can be used to parse SVG paths. The PathParser needs a class which implements the PathHandler interface. For the basic functions I wrote some code to create ArcTo, LineTo, MoveTo and CubicCurveTo objects. If someone wants to support all possible elements of a SVG path he must implement the methods which throw a ParserException. The result is a Path which can be used as input for a PathTransition. 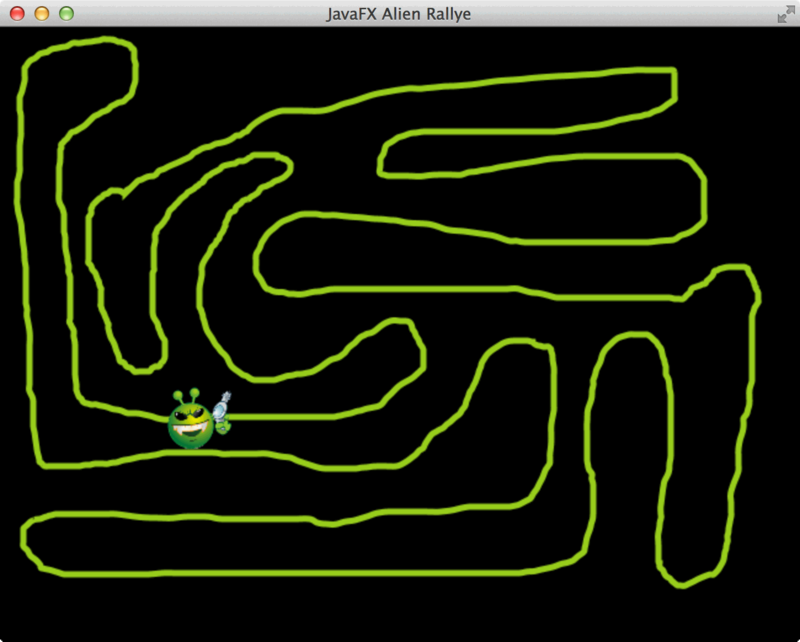 The source code is available at GitHub: JavaFX-AlienRallye.